Butter needs no introduction. It is a wonderful, delicious, nutritious yeah, I said it, practical, indulgent entity all its own. 1. 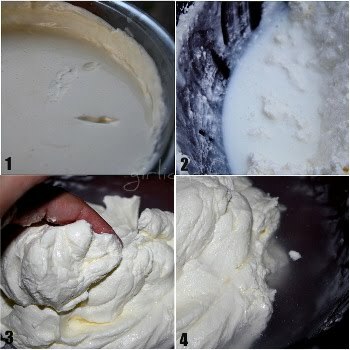 Combine cream and yogurt together in glass bowl. Cover tightly with plastic wrap and let sit at room temperature for 12-18 hours. It will get very thick and delicious looking! Once it has cultured, place it in fridge or bowl of ice water to reach a temperature of ~60 degrees F.
2. Prepare a bowl of ice water; set it aside. Place the cultured cream a large mixing bowl (or the bowl of a stand mixer) and beat with whisk/attachment on high speed until stiff peaks form. Reduce speed to low and watch closely. Once the mixture breaks (butter separates from buttermilk), turn off the mixer. Pour the buttermilk into a clean container. You can use this just as you would commercial buttermilk for drinking or baking. If you aren’t going to use it within a week or so, it can be frozen and used later for baking. 3. Press the butter with a spoon, spatula, or your hands to remove as much buttermilk as possible. I found it easiest to use a flexible rubber spatula here. Add any buttermilk to the rest you've already gathered. Pour water from the bowl of ice water over the butter to cover. Rinse the butter by kneading it under the water. 4. Dump water and repeat until the water becomes clear. It is necessary to remove all the residual buttermilk in order to keep the butter from spoiling too quickly. Once the butter has been cleaned thoroughly, knead it on the counter for a minute. If you want to salt the butter, press the butter out on the counter, sprinkle lightly with salt, then knead it in. I decided to divide my butter into thirds (not precise thirds...just three pieces, I suppose). Into the one, I kneaded fleur de sel gris. Into another, I kneaded Black Truffle sea salt. Into the last, I kneaded a dried jalapeño/garlic/onion/salt blend that I received in the mail from my friend Linda from New Mexico. To store the butter, you can press it into ramekins or roll it into logs. Cover the ramekins or wrap the logs tightly in plastic wrap. You can make more than one roll from the butter and freeze one once you've wrapped it well. I ended up with ~2 c. of scrumptious, tangy buttermilk and three rolls of butter, weighing a total of 21 oz. (~1 1/3 lb.)!! The buttermilk was delicious enough to drink straight up...which I did with a bit of it, the rest I reserved for baking. ALL three of the butter "flavors" were out of this world. I mean, it was amazing all alone I licked it from my hands after kneading it yet equally amazing with the regular sea salt and the flavored salts. The salted butter is fabulous anywhere you'd normally use butter...the jalapeño butter is soooo sinful slathered on a piece of hot, crusty toast or for tossing just cooked veggies in. The truffle butter...aaaahhhh...on eggs, potatoes, meat- grill a steak and cut off a slab of it and let it melt into the top of the hot steak...nothing compares! If you've never made your own butter, you should definitely give it a go! It's super easy and rewarding. You make regular butter the exact same way, just w/out adding the yogurt and going through the culturing step. But boy, oh boy, do I LOVE the cultured buttermilk and the slight tang it gives the butter, too. Feel free to join us over at Forging Fromage...add your link to the linky for the month in which you make it and we'll add you to the roundup! Also, since cultured butter is the current BOM challenge, you can join in the (open) challenge over on Facebook. Funny huh...a cheesy place and a bready place both featuring...well...something that's not cheese or bread this month!? But at the same time...it's so natural. Cheese and butter are both dairy products. Bread and butter go hand in hand. So, not really "funny" at all. The links are below if you are interested! *Today is your last chance to enter my GIVEAWAY for your chance at winning a $75 gift certificate to NOVICA! All entries must be entered by Monday, August 16 at 11:59 PM, Eastern time! I've made butter many times but never with yogurt- it sounds delicious! Homemade butter is always better. I love your suggestion of the different flavorings for the butter. Thanks! I don't think I've ever had cultured butter. It looks fantastic...especially the jalapeno one! Yum! Omg.. I can't wait to try this! I want to try the recipe too! Making your own cheese earlier, now the butter! You are a real foodie! I grew up on a farm/ranch with milk cows a part of the tribe. I slightly remember some butter churning going on and plainly remember how good it was. Great post Heather. I've never had cultured butter before. I can't imagine why not. Sounds fantastic! It looks great! I've made butter, since I grew up on a farm with many cows, but have never used yogurt with it. We even made butter in school one day. Your recipe sounds great, thanks! 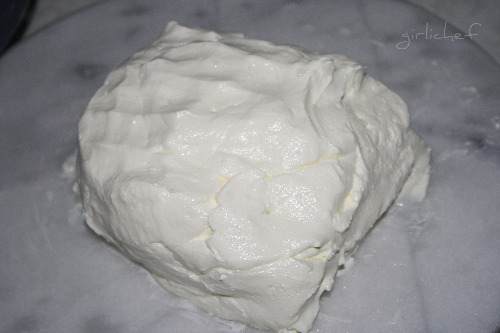 A very cool recipe for butter with yogurt, I would love to try this for sure! This is so different from how we make butter. Got to try this one. Man....you can make ANYthing! I am impressed. I love that you did the three flavours! I might just dehydrate some jalapeno and copy you..
Beautiful butter! I am really looking forward to this one. Your butters all sound delicious. I definitely want to give this a try. I have only made butter with kids by shaking cream in baby food jars. Thanks for the step-by-step instructions. ooohhhhh....melting on warm sourdough bread? Sounds good. You are really amazing!! I needed this...YESTERDAY! For my feta. =) This is really excited. And I love the different versions. Yum! Sounds great. Your homemade butter looks great, have never tried making it myself. I find making these basic ingredients at home very very interesting, personally i make ghee at home, in case you don't know what ghee is ..it is clarified butter mostly used in indian cooking. will try out your butter recipe!! you're my hero, seriously. my mouth was watering at the thought of fresh homemade butter. i'd just have to find a bread worthy! do you think this would be something you could do with young kids? Wow... inspiring post! If I ever thought I wanted to try to make butter I really want to try it now!!!! Alton Brown (boring I know) was the first one I ever heard say, "butter is fantastic and fatty and get over yourself"! Words to live by. Glad you liked the recipe! I thought about using truffle salt last time I made this, but ended up using fleur de sel. 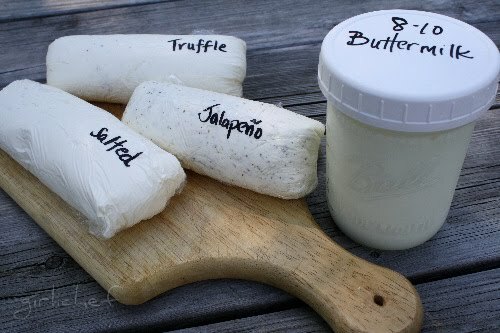 I'll definitely be making truffle butter next time! You are amazing Heather. I CANNOT let my husband visit your site, lol! I did GAARP! It is so fantastic...thanks so much for sharing your recipe with us!!! urmom...not boring at all...I love Alton Brown! hmmm yummy! the trick is the yogurt? yes! The flavors you have should sell us on making butter. How do I tell you that I almost never have butter, in the house. Before you start fluttering at me, it is because of the rules of kosher. We do not eat meat and dairy at the same meal so it is easier for me not to put butter into cakes, breads and the likes so no butter. It looks like fun, work that is fun is good. Thanks for linking this to My Meatless Mondays. Thanks for the hard work. In india, we always make cultured butter. I love the buttermilk that remains after churning the butter. Just add some sea salt (may b little cilantro) it is heaven! You are a total inspiration with your homemade butter! Butter has been maligned for too long. You make this look and sound so easy. I really must find some time to give this a try sometime. Thanks. You know I'm all over this!!!! My favorite food. I've got three pounds of homemade butter that I'm going to use with what's left of my summer herbs to make some compound butter. Wow, that looks fantastic - I have sooo got to try that. I've been longing to have a go at making cheese, but haven't been brave enough to try yet. Starting with this butter seems like a good idea. Oh yeah I love the look of that butter sitting their all happy and ready for kneading. What a lovely lovely post. And the flavors, oh my I love all the flavors too! Thanks so much for linking up to Just Another Meatless Monday, hope to see you next week!! And DAMN-missed your giveaway! As a kid we made butter in class by shaking a jar filled with cream. There was a marble inside to help churn it. Never thought about making homemade butter until now. Your butter flavors sound delicious! Wow, the different flavors sound awesome. I have to try the jalapeno butter next time. Yes, there will be a next time for me because I loved the buttermilk soooo much!!! You never cease to amaze me! I am going to try this for sure. I have a ton of flavored salts that would be perfect in it. Love the idea of the yogurt in it for the "tangy" factor too. Fun! That sounds pretty darn good. We've made creme fraiche by following the first step (and using buttermilk rather than yoghurt to set the cream) but had never thought (ie: known) to take the next step to make butter. How cool! Brilliant. I can't wait to try making my own butter. I love doing anything that makes me feel like a farmer's wife. Especially when I can go back to my urban comforts, straight afterwards. Oh goodness! I am loving this post! I've got to get some of that truffle salt! Great post! Will be referring folks here who want to know how to do this! Thanks for stopping by and sharing at Monday Mania! That is awesome. I want to make the butter but haven't found cream that isn't ultrapasteurized! Yours looks so good! And I love buttermilk--would love to have some of my own! Hey Cookie! That is curious...but I'm betting it had something to do with the cream we used...I can't imagine another explanation.